The FMCG space that deals in food products and sanitary products could be a big beneficiary of this announcement by the GST Council. The 28th meeting of the GST Council conducted on July 21, 2018 was expected to make some major changes in the rates of GST. But the actual GST meet went much beyond that. Instead of some random cuts in GST across the board, the Council went so far as to do a virtual restructuring and rationalizing of the GST rates. Broadly, many goods of daily consumption were either pushed into the 5% GST bracket or the 0% GST bracket. On the other hand, many durables and non-durables of mass consumption that did not deserve to be in the 28% bracket were shifted down to the 18% bracket. This virtually leaves just a list of 13 demerit goods in the top bracket of 28% GST. The table below captures some of the key rate shifts. The focus has been on needs of mass consumption and discretionary choices of mass consumption. The GST Council has also made an attempt to bring items with strong rural consumption bias into the lower GST brackets. For example, the Council has brought some items of mass consumption like fortified milk, brooms and sanitary pads under the 0% GST bracket to make these products cheaper and also to encourage consumption in a bigger way. At the higher end of the bracket, there were products like refrigerators, televisions and washing machines that were classified as demerit goods. That was obviously an anomaly. These are items of aspirational consumption and classifying them along with items like cigarettes and luxury cars as demerit goods were out of sync. It can be said that with this exercise, the tweaking of GST rates appears to have achieved a degree of stability and we cannot expect many more product-specific tweaks in the future. What will be the key implications of these GST rate announcements? If you look at the items that have been exempted from GST or where the GST rates are reduced, the focus has been on items of mass consumption and where there is a strong rural demand twist. For the consumers, it surely makes a lot of these products cheaper. 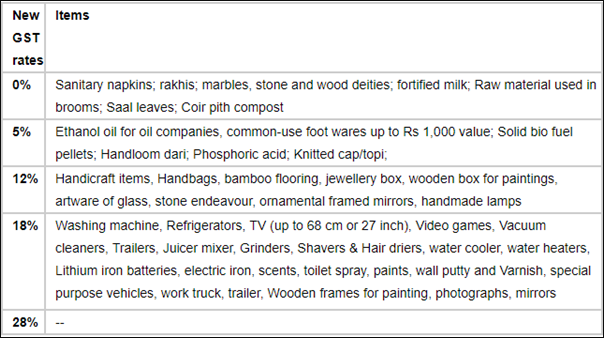 Be it fortified milk, sanitary pads, brooms or handlooms (this looks like an anti-plastics drive), these are items of mass consumption. This move will expand the consumption and also embrace more users into their fold. What does this move mean for companies and businesses? Two broad segments of the Indian industry could benefit from this move. The FMCG space that deals in food products and sanitary products could be a big beneficiary of this announcement by the GST Council. We have seen companies like HUVR announcing stellar growth numbers this quarter and that trend could get a leg up. Secondly, producers of durables like televisions and washing machines could get a leg-up as lower GST rates get passed on to the end consumer. Discretionary could be the big story for urban, semi-urban and rural market segments of India. Specific industries like paints could benefit due to the reduction of GST from 28% to 18%. Paint companies have already announced their intent to focus on expanding market share by passing on the benefit to the end customers. Businesses having turnover up to Rs5 cr can now file GST returns quarterly. While the payment of GST will still have to happen on a monthly basis, this quarterly filing of returns will surely reduce the compliance burden for small businesses. This is likely to provide relief to nearly 93% of the GST registered companies. Hotel segment is set to benefit as they have been exempted from the 28% GST if the tariff is less than Rs7,500/day. The decision point will be the actual tariffs paid and not the published tariffs, which is again a boost to hotel stocks. The threshold for the composition scheme has been raised from a turnover of Rs1cr to Rs1.5cr. At the same time, the reverse charge mechanism has been deferred by a period of 1 year. For more simplistic filing of returns, the Council has also announced the launch of GSTR Sahaj and GSTR Sugam, which will be a 2 page form to file the GST returns for small and medium size enterprises. Considering that the chunk of the GST related issues are coming purely from the small businesses, the GST Council has announced that the next GST Council meeting on August 4, 2018 will be entirely focused on the MSME Sector and the specific issues and challenges faced by this segment.